KAMPALA -Government has entered a Memorandum of Understanding with district local governments to start a process that will eliminate the distribution of free agricultural inputs and implements, according to a senior official at the Ministry of Agriculture. This comes more than a year after Members of Parliament asked government to also stop distribution of free seeds under the government programme of Operation Wealth Creation. 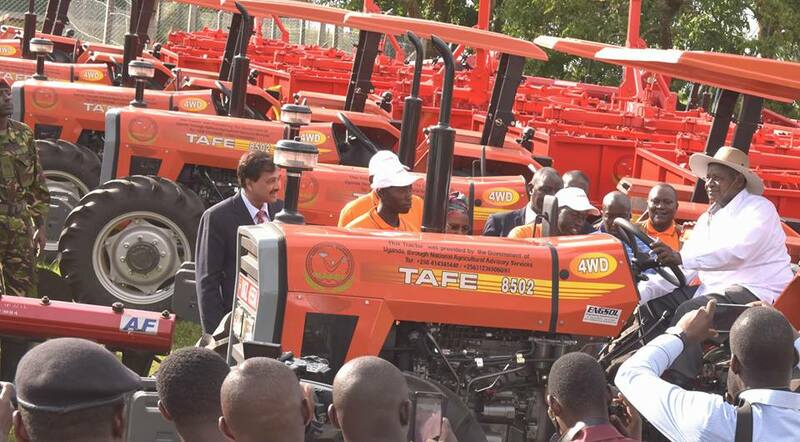 The government, under Operation Wealth Creation (OWC), among other initiatives, has been distributing free agricultural inputs and implements to boost farming across the country. Ms. Beatrice Byarugaba, the Ministry of Agriculture director of extension services, said the process has already kicked off with a MoU that will require accounting officers in the districts of Kalungu, Ntungamo, Iganga, Nebbi, and Amuru to eliminate the free provision of agricultural inputs from their budgeting activities. The MoU, which was signed on the sidelines of the Joint Agricultural Sector Annual Review conference last week, spells out guidelines that district authorities and the Ministry of Agriculture are expected to undertake over a six-year pilot period. “We want our farmers to be business people. We want them to start thinking and acting like business people. This is why we want them to invest in agriculture by buying inputs,” Dr. Byarugaba said. The programme, which will act as a pilot project, was unveiled nearly two years ago with the aim of building a more sustainable agricultural sector and the project is expected to cost about $150m (Shs565b) and will be rolled out to other 42 districts in the country. Under the Agriculture Cluster Development Project (ACDP) funded by the World Bank and implemented by the Ministry of Agriculture, government hopes to pursue a phased withdrawal from the free distribution of inputs, particularly seeds to the farmers. Dr Byarugaba said farmers waste free things, thereby necessitating government to build a sustainable model that will make farmers invest in agriculture as a business. She added that government hopes that the pilot project, which focuses on promoting particular crops in different districts, will increase on-farm productivity, production, and marketable surpluses. According to a statement issued by the Ministry of Agriculture last week, the project will be implemented in a cluster format with each cluster assigned a particular trial commodity covering on average three districts. The statement said the cluster will facilitate concentrations of producers and agribusiness institutions, usually in the same sector, to work together in addressing common challenges and opportunities. According to government, the cluster approach will provide opportunities for economies of scale, utilization of common market infrastructure, input and output bulking and enhanced value addition. Dr Byarugaba said the lessons learned from the pilot districts will guide a phased roll out in the rest of the country except in the Karamoja sub-region which has been excluded because it has a different intervention scheme driven through the Regional Pastoral Livelihoods Resilience Project. Mr. Pius Wakabi the Permanent Secretary Ministry of Agriculture, Animal Industry and Fisheries who signed the memorandum of understanding on behalf of the Ministry Agriculture, urged that the Shs565b to be invested in the pilot project must be put to proper.